Check 4 Pics One Word daily puzzle answers with its clue images below. Jan 19 2019 solutions of 4 Pics 1 word is solved based on these 4 Clue images. The first clue is A small boy or Kid thinking image. Right side of the boy a thinking symbol is there. The 2nd Clue is A Women bubbling Chewing gum. The 3rd Clue is A girl making bubbles with water and Snow items. 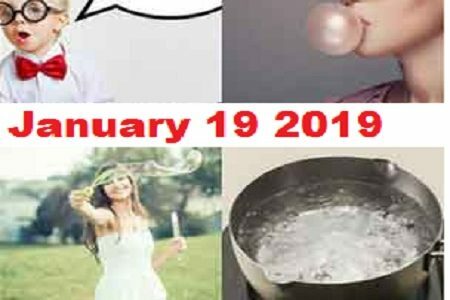 the fourth clue of 4 Pics 1 Word 19th Jan 2019 is water boiling in a hot pan and making generating bubbles. Based on the above clues and Length of the words. The answer is solved as below.